Neurodegenerative disorders cause cognitive impairment in the patients that can be accessed by various tests available in the clinical setups. These tests mainly analyse the executive functioning and visual-spatial memory of the patients to evaluate their mental health. In order to detect primary as well as secondary cognitive disorders, these tests are aimed to be simple, fast, cost-efficient and substantially validated. In order to achieve these standards, improved versions of previously developed tests, like minimal mental state examination, have been developed. Recently, computerized batteries with increased sensitivity have also been introduced to save time and reduce any chances of human error. However, further research needs to be performed to improve and validate these tests. Assessment of cognition is a useful tool for analysing neurodegenerative diseases. It helps to screen cognitive problems in patients suffering from neurodegenerative diseases and evaluate the extent of severity of a disease. The cognitive impairment tests help to diagnose not only the late stages of disease like dementia but also help to detect the lack of cognitive abilities at primary stages like mild cognitive impairment (MCI). An efficient assessment of cognition may also disclose the cause of a neurodegenerative impairment thereby facilitating the correct diagnosis of a disease. Cognition also helps to predict mortality during hospital admissions (Ekstrom et al. 2017). The practical applications of cognition assessment necessitate the development of better skills and methodologies that could benefit the clinicians and neurologists for improving patient’s condition (Woodford and George, 2007). The current review covers the research performed on the most commonly used cognition tests in the last five years. It critically evaluates various methods used for assessing cognition in neurodegenerative diseases analysing their efficacy in the clinical setups. It will highlight the drawbacks in the existing methods and how they have been overcome in the recently developed methods. In addition, suggestions for improving various methods will also be presented. questions (Table 1), developed by Folstein, Folstein and McHugh (1975) for quantitative estimation of cognitive impairment. to use include patients from different age groups. In addition, this study included only those patients whose first language was German. Therefore, the results may have cultural background bias. Severe Minimal Mental State Examination (SMMSE) is a modification of basic MMSE test for the evaluation of severe cognitive impairment as in the cause of Alzheimer’s disease. This test includes simple questions related to complete name, spellings, verbal fluency and visual-spatial abilities. In addition, it tests receptive and expressive language skills among severely impaired patients. Wajman et al. (2014) found that age and gender had no impact on the results of this test. However, the results of SMMSE were influenced by schooling of the patients. They found that schooling did not have any impact on MMSE scores while it influenced the scores of SMMSE test. Therefore, in order to make this test fit for all the patients, it is recommended to remove the educational bias from the questions included in this test. In addition, similar analysis should be performed on other tests used for the evaluation of severe cognitive impairments including test for severe impairment (TSI), severe impairment battery (SIB), severe cognitive impairment profile (SCIP) and Modified Ordinal Scales of Psychological Development (MOSPD). Another method for cognition assessment includes abbreviated mental test (AMT) that involves just 10 questions for cognitive evaluation in only 3 minutes. Recently, a four question version of AMT, named as AMT4, was also introduced that was expected to be used for routine cognitive assessments. However, Dyer et al. (2016) tested AMT4 in an Emergency Department and found that this test had substantially low sensitivity. They therefore, rendered this test unfit for use as a general cognitive screener in the emergency departments. In addition, the test was found to have different cut off values for educated versus uneducated thereby showing educational bias (Chan et al. 2013). Extremely short tests are expected to be less sensitive. Thus, while achieving time effectiveness, the sensitivity of the test should not be compromised. In addition, the choice of question should be made carefully to exclude any educational bias. For instance, question asking counting 20-1 backwards may be replaced with some general question that is easy to answer for uneducated individuals. It is a simple and brief test that involves one memory, two calculations and three orientation questions, making total of six questions. Hessler et al. (2016) investigated the psychometric quality of 6-CIT for the detection of dementia in general hospital patients. They found that this test outperformed the nurse ratings for dementia diagnosis among the older patients. In contrast, evaluation of primary care patients by Connon and Larner (2017), using 6-CIT, revealed high sensitivity but low specificity for the diagnosis of dementia. Therefore, this needs to be further validated before its utility in the primary care setups. The calculations involved in this test are also expected to create educational bias in the results. Hence, there is a need for modifications in the test followed by validation studies on substantial number of patients. Ascertain Dementia 8 is a questionnaire containing eight questions to evaluate the patients with Alzheimer’s disease. This questionnaire tests judgement, orientation, memory and function of the patients via informant-rated or self-rated test. Chio et al. (2017) compared the self-rated AD8 with informant-reported AD8 in patients of average age 77. Although it was previously known that this test can be rated by the patient himself, Chio et al. (2017) reported that the results of informant-rated AD8 were more accurate as compared to those of self-rated AD8 test. This study shows that although AD8 is quick and simple, it produces better results with trained human staff. As the name indicates, Clock Drawing Test (CDT) asks the patients to draw a clock. It is mainly a visual-spatial test that requires the patients to draw a clock, place the numbers and draw the hands to indicate a time (usually 10 past 11). This test has the advantages of brevity, simplicity and lack of any educational, cultural or language bias. However, many studies argued that this could not differentiate between subtypes of dementia. Recently, Ricci et al. (2016) introduced a new three-cluster scoring system for CDT. Their results indicated that CDT successfully differentiated the healthy MCI and mild Alzheimer’s disease patients. Intersecting pentagons is also a useful visuospatial test that requires the patients to copy the design of intersecting pentagons. 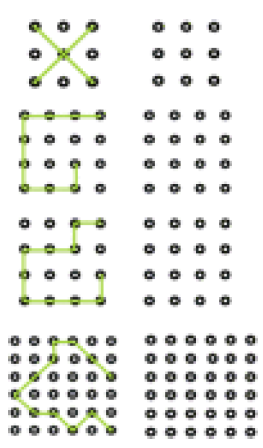 Recently, a brief LSD-4 test has been introduced that requires correct reproduction of four letters or shapes as shown in Figure 1. The results of this test on patients revealed good ability to detect the cognitive impairment (Williams et al. 2017). However, further research needs to be done on its validation for practical applications. In addition, random comparisons with the already available CDT test should also be made using large sample sizes. The Mini-Cog test is a combination of memory test with Clock Drawing Test. 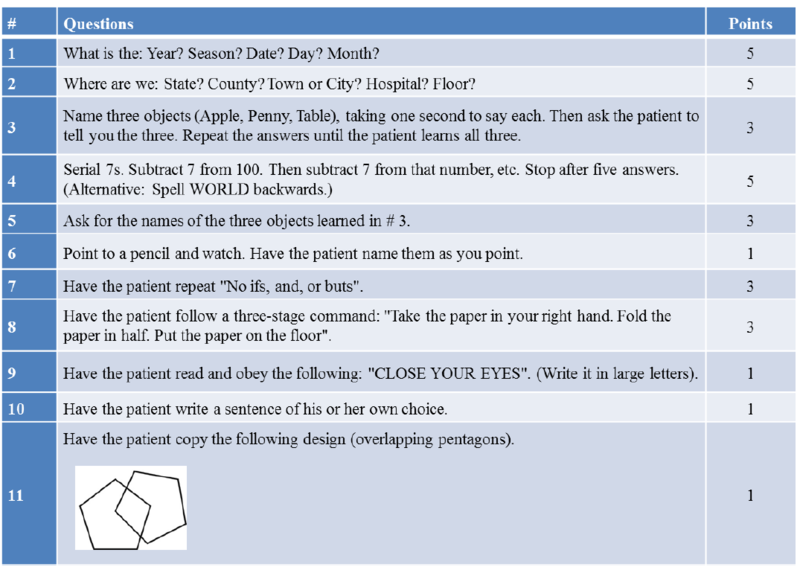 The patient has to recall three words after drawing the clock. In a recent study, Yang et al. (2017) tested the psychometric performance of various cognitive tests including MMSE, CDT, AD8 and Mini-Cog test. Their results indicated that Mini-Cog test outperformed all the tests and even combination of various cognitive tests. They found that Mini-Cog tests showed better sensitivity and specificity for the diagnosis of early dementia in elderly patients. However, their study included people from eastern China only and did not cover age groups other than above 65 years old people. Therefore, similar comparative research needs to be conducted on people of various cultural background and different age groups. In addition, other important cognitive tests like MoCA/MACE can also be included in the study for better comparison. with only a few patients. It is suggested to increase the patient number and perform the test on patients of different age groups and cultural backgrounds. It is a brief (5 minutes) test used to detect primary cognitive impairment. Unlike the routine cognitive tests like MMSE or AMT, GPCOG involves a patient assessment in addition to the brief interview. Interestingly, GPCOG has been found to be free of any demographic biases. Comparison of GPCOG with the most commonly used MMSE and AMT tests revealed that CPCOG had higher sensitivity in less time as compared to MMSE and AMT (Brodaty et al. 2016). Therefore, this test successfully overcomes the drawbacks of time efficacy and any kind of bias resulting in efficient evaluation of cognitive impairments. However, its practical implementation needs well-trained staff (Brodaty et al. 2016). Mild cognitive impairment (MCI) can be accessed by Montreal Cognitive Assessment (MoCA) test that evaluates memory, language, calculation, visual skills and concentration in 10 minutes with a paper and pencil test. It is an excellent test for timely diagnosis of MCI that prevents the onset of dementia and other serious complications due to the onset of well-timed treatment. It involves fewer learning trials, more words and longer delay before recall that results in its high sensitivity for the detection of MCI caused by various neurodegenerative diseases including Alzheimer’s disease, Huntington’s disease, Parkinson’s diseases etc., as compared to MMSE (Fiorenzato et al. 2016). This test was initially designed for highly educated people which made it unfit for uneducated people. Nevertheless, a basic version of this is also available to overcome this drawback (Yavuz et al. 2017). fast, more efficient and different tests than what are already available for the cognitive evaluation. Although MoCA is a sensitive and effective test for a wide range of neurodegenerative disease, there may be better tests available for certain medical conditions. For instance, Zhang and Feinstein (2016) reported that a ten minutes computerized test had higher sensitivity, for detecting cognitive impairment in patients with traumatic brain injury, as compared to the ten minutes MOCA test. This computerized battery for cognitive assessment measured multiple aspects of cognition but with a different emphasis leading to improved sensitivity. However, this computerized test ruled out other factors including emotional stress, depression or anxiety and could not differentiate between mild, moderate and severe TBI patients. Therefore, the researchers recommended the use of this test only in the absence of neuropsychological services. The computerised battery is an interesting addition to the tools of cognition assessment because it does not need special training and reduces the chances of human error. In addition, it is easy to incorporate in busy clinical settings. For instance, Khetani et al. (2017) performed a 30 or 15 minute computerised cognitive test in a busy paediatric emergency department. Although, they tested only a small number of children (49 children), they found that the short test can easily performed with the children. However, environmental and testing considerations, like noise reduction, need to be considered before implementation of these tests in clinical settings. Therefore, the researchers should focus on developing computerised tests while considering the exact type of disease, clinical history and related health problems (depression, anxiety etc.) of clinical subjects. screening seem to be an interesting and economical need of the hour. Further exploration and research needs to be done in this area. However, any test that is economical, shows time efficacy and promising results for patient evaluation needs to be tested on sufficiently large number of patients and properly validated before being brought into the clinical setups. Apolinario, D., Lichtenthaler, D.G., Magaldi, R.M., Soares, A.T., Busse, A.L., Gracas Amaral, J.R., Jacob‐Filho, W. and Brucki, S.M.D. (2016) Using temporal orientation, category fluency, and word recall for detecting cognitive impairment: the 10‐point cognitive screener (10‐CS). International journal of geriatric psychiatry. 31(1), pp. 4-12. Brodaty, H., Connors, M.H., Loy, C., Teixeira-Pinto, A., Stocks, N., Gunn, J., Mate, K.E. and Pond, C.D. (2016) Screening for Dementia in Primary Care: A Comparison of the GPCOG and the MMSE. Dementia and Geriatric Cognitive Disorders. 42(5-6), pp. 323-330. Chan, T.C., Luk, J.K.H., Shea, Y.F., Chan, S.S.K., Lau, K.H., Chan, F.H.W., Yu, G.K.K. and Chu, L.W. (2013) Influence of education and age on the abbreviated mental test in Chinese nursing home older adults. Journal of the American Medical Directors Association. 14(2), pp. 137-139. Chio, O.I., Yip, P.K., Liu, Y.C., Chen, L.H., Wang, P.C., Tsai, T.H. and Tang, S.H. (2017) Detection of cognitive impairment using self-rated AD8 and informant-reported AD8. Journal of the Formosan Medical Association. Connon, P. and Larner, A.J. (2017) Six‐item Cognitive Impairment Test (6CIT): diagnostic test accuracy study in primary care referrals. International Journal of Geriatric Psychiatry. 32(5), pp. 583-584. Dyer, A.H., Briggs, R., Nabeel, S., O’Neill, D. and Kennelly, S.P. (2016) The Abbreviated Mental Test 4 for cognitive screening of older adults presenting to the Emergency Department. European journal of emergency medicine: official journal of the European Society for Emergency Medicine. Ekström, I., Sjölund, S., Nordin, S., Nordin Adolfsson, A., Adolfsson, R., Nilsson, L.G., Larsson, M. and Olofsson, J.K. (2017) Smell loss predicts mortality risk regardless of dementia conversion. Journal of the American Geriatrics Society. Fiorenzato, E., Weis, L., Falup-Pecurariu, C., Antonini, A. and Biundo, R. (2016) MoCA vs. MMSE sensitivity as screening instruments of cognitive impairment in PD, MSA and PSP patients. Parkinsonism & Related Disorders. 22, pp. e59-e60. Folstein, M.F., Folstein, S.E. and McHugh, P.R. (1975) “Mini-mental state”: a practical method for grading the cognitive state of patients for the clinician. Journal of Psychiatric Research. 12(3), pp. 189-198. Hessler, J.B., Schäufele, M., Hendlmeier, I., Nora Junge, M., Leonhardt, S., Weber, J. and Bickel, H. (2016) The 6‐Item Cognitive Impairment Test as a bedside screening for dementia in general hospital patients: results of the General Hospital Study (GHoSt). International journal of geriatric psychiatry. Wiley Online Library. Hsieh, S., McGrory, S., Leslie, F., Dawson, K., Ahmed, S., Butler, C.R., Rowe, J.B., Mioshi, E. and Hodges, J.R. (2015) The Mini-Addenbrooke’s Cognitive Examination: a new assessment tool for dementia. Dementia and geriatric cognitive disorders. 39(1-2), pp. 1-11. Khetani, A.M., Brooks, B.L., Mikrogianakis, A. and Barlow, K.M. (2017) Incorporating a Computerized Cognitive Battery Into the Emergency Department Care of Pediatric Mild Traumatic Brain Injuries-Is It Feasible?. Pediatric emergency care. Larner, A.J. (2017) MACE versus MoCA: equivalence or superiority? Pragmatic diagnostic test accuracy study. International Psychogeriatrics. pp. 1-7. Pasi, M., Salvadori, E., Poggesi, A., Ciolli, L., Del Bene, A., Marini, S., Nannucci, S., Pescini, F., Valenti, R., Ginestroni, A. and Toschi, N. (2015) White Matter Microstructural Damage in Small Vessel Disease Is Associated With Montreal Cognitive Assessment But Not With Mini Mental State Examination Performances. Stroke. 46(1), pp. 262-264. Ricci, M., Pigliautile, M., D’Ambrosio, V., Ercolani, S., Bianchini, C., Ruggiero, C., Vanacore, N. and Mecocci, P. (2016) The clock drawing test as a screening tool in mild cognitive impairment and very mild dementia: a new brief method of scoring and normative data in the elderly. Neurological Sciences. 37(6), pp. 867-873.
primary care patients than the original MMSE? Results of the German study on ageing, cognition, and dementia in primary care patients (AgeCoDe). Psychological assessment. 27(3), pp. 895. Tombaugh, T.N. and McIntyre, N.J. (1992) The mini‐mental state examination: a comprehensive review. Journal of the American Geriatrics Society. 40(9), pp. 922-935. Wajman, J.R., Oliveira, F.F.D., Schultz, R.R., Marin, S.D.M.C. and Bertolucci, P.H.F. (2014) Educational bias in the assessment of severe dementia: Brazilian cutoffs for severe Mini-Mental State Examination. Arquivos de neuro-psiquiatria. 72(4), pp. 273-277. Williams, O.A., O’Connell, H., Leonard, M., Awan, F., White, D., McKenna, F., Hannigan, A., Cullen, W., Exton, C., Enudi, W. and Dunne, C. (2017) Development of the four-item Letter and Shape Drawing test (LSD-4): A brief bedside test of visuospatial function. Psychiatry Research. 247, pp. 317-322. Woodford, H.J. and George, J. (2007) Cognitive assessment in the elderly: a review of clinical methods. The Quarterly Journal of Medicine.100, pp. 469-484. Xue, J., Chiu, H.F., Liang, J., Zhu, T., Jiang, Y. and Chen, S. (2017) Validation of the Six-Item Screener to screen for cognitive impairment in primary care settings in China. Aging & Mental Health. pp. 1-5. Yang, L., Yan, J., Jin, X., Jin, Y., Yu, W., Xu, S., Wu, H., Xu, Y. and Liu, C. (2017) Estimation of diagnostic performance of dementia screening tests: Mini-Mental State Examination, Mini-Cog, Clock Drawing test and Ascertain Dementia 8 questionnaire. Aging & Mental Health, pp. 1-5. Yavuz, B.B., Varan, H.D., O’Caoimh, R., Kizilarslanoglu, M.C., Kilic, M.K., Molloy, D.W., Dogrul, R.T., Karabulut, E., Svendrovski, A., Sağır, A. and Cankurtaran, E.S. (2017) Validation of the Turkish Version of the Quick Mild Cognitive Impairment Screen. American Journal of Alzheimer’s Disease & Other Dementias®. 32(3), pp. 145-156. Zhang, J.Y. and Feinstein, A. (2016). Screening for cognitive impairments after traumatic brain injury: a comparison of a brief computerized battery with the Montreal Cognitive Assessment. The Journal of Neuropsychiatry and Clinical Neurosciences. 28(4), pp. 328-331.